Just like any Apple product, you can extend iPad functionality by adding different apps and gadgets. We have already seen host of free iPad applications to spice up iPad experience. You can import personal photos into iPad and relish them in crystal clear big screen of iPad. Best way for transfer of images from iphone device or photos from digital camera to iPad is by using iPad Camera Connection Kit. iPad Camera Connection Kit contains two pieces of hardware for your iPad: the Camera Connector and the SD Card Reader. 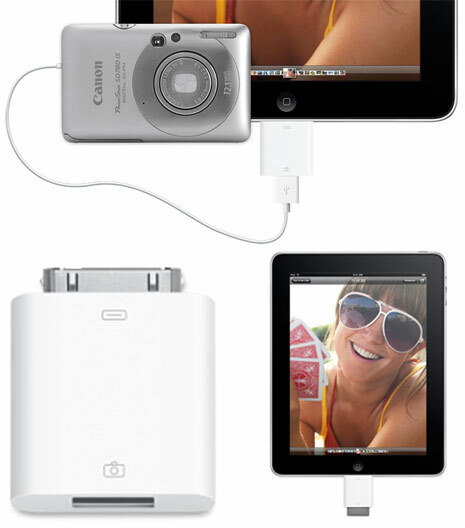 Using these connectors you can quickly transfer photos into iPad from any digital camera with USB interface or SD card. 1. For digital camera photo transfer, connect Camera Connector to the iPad. Then use cable for connecting camera and the camera connector port. Use the SD card reader to transfer photos from SD card source. 2. After successful connection, iPad will open the photo app on the screen. You can select photos that should be imported and further organize them into albums. iPad and the Camera Connection Kit support standard photo formats, including JPEG and RAW. Does any one know if this device will work on the iphone? I will be on extended trip with out a computer and need a way to up load photos to the internet. I hoped an iphone would be able to do this but i can’t find a away to get the photos off the camera and to the phone. I think its step by step guide is most helpful.